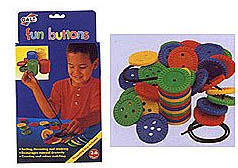 Set of 40 colourful buttons for many different activities. Fun to thread and easy to stack with serrated rims. Progress to counting and sorting by colour and hole pattern. Size (inches): 11.18" X 6.10" X 1.38"
Ages: 2 to 6 years.